There is no more romantic style of garden design than cottage gardening. With its billowing, slightly chaotic, abundance, you’d be forgiven for thinking there is not plant involved. However even the uncontrolled look takes work. Another important element of cottage gardens is the choice of plants. You want plants that will blend and weave together, not stand at attention in tidy rows. You also want plants that will spread - within reason - and ingratiate themselves throughout your garden. There are classic cottage garden plants that will create the backbone for your cottage garden. The 7 discussed here will add instant romance and charm to a garden, no matter its size or location. The bellflowers offer a wide range of choices, some perennial, others annual. Some grow upright, others creep along the edge, peeking out from under other plants. Some well-behaved, others are borderline garden thugs. Most will reseed themselves nicely. All are charming. Bellflowers have a woodland quality that looks great in drifts, and give a natural look to cottage gardens. The soft, clear colors are perfect complements to roses and gray leaved plants. One of the most popular species is the peachleaf bellflower (Campanula persicifolia), shown here. It can grow 15 - 30 inches tall with spikes of bell-shaped flowers in white, pinks, and purples. Other great tall choices include: Canterbury bells (C. medium), a biennial, Clustered bellflower (C. glomerata), and Milky bellflower (C. lactiflora). For edging I love Carpathian harebell (C. carpatica) ‘Blue Clips’, which forms a carpet of long blooming blue bells. This hard working perennial does not get the respect it deserves. Maybe that’s because the original species can be weedy and unruly. Newer varieties offer tall, mounding plants that reseed controllably and bloom profusely. These are carefree plants, widely adaptable to poor soil or a coddled perennial bed. They add that billowy element to cottage gardens, both with their soft, flowing shape and the hazy, blue color. They also self-sow gradually throughout the garden, adding a sense of cohesion. The soft, sliver-gray leaves are fragrant and deer resistant. The flowers can be a vibrant blue and, if you shear the plant when the flowers are fading, it will bloom again - and perhaps again. Popular cultivars include: 'Walker’s Low' (2 - 3 ft.), 'Six Hills Giant' (3 - 4 ft.) and 'White Wonder' (1 1/2 to 2 ft.), with soft white flowers. There’s a reason clematis is called “Queen of the Vines”. These delicate beauties truly make themselves at home in the garden. They will cling and poke through anything nearby, so don’t stand still too long. Clematis are perennial flowering vines that get better and better with age. They are broken down into 3 categories: early blooming, late blooming and repeat blooming. I’ve always found it best to plant one or two of each, so there is always something in bloom. Although, even their seed pods are interesting. The large flowered varieties get a lot of well-deserved attention. 'Jackmanii', 'Alba Luxurians', and the fluffy, double, 'Viennetta ' all have flowers 3 -4 in. flowers. The small flowered varieties are finally gaining in popularity. Tulip-shaped Clematis 'Princess Diana' joins the ranks of the small, bell-shaped 'Betty Corning ' and 'Rooguchi '. And then there is the Sweet Autumn Clematis (Clematis terniflora), a frothy ramble of white blooms, at the end of the season. Whether the true hardy geraniums or the zonal Pelargoniums, there is something very cottage-ish about them. Here I’m talking about the true geraniums that are low-growing and tend to spread and creep around other plants. These are lovely plants for edges, where they will slowly encroach on paths and soften edges. They also act as a living mulch and help to cut down on weeds. Many varieties will repeat bloom. While they do self-sow, they can be a bit slow about it. However the plants themselves spread quickly and are easy enough to divide. The plants can get a little ragged looking by mid-summer, after flowering. If you shear them back to a few inches from the soil, they will re-prout fresh, new growth and many will begin blooming again. Shearing is a time-saver, compared to deadheading. Iris have been one of the most popular perennial flowers for decades. They are just so distinctive, with their fans of sword-like leaves and those majestic flowers with their 3 upright standard petals and3 swept back falls. There are hundreds of iris species. The tall bearded iris are old-fashioned favorites, blooming about the same time as peonies. They can get top heavy and easily fall over, and might not be the best choice for a cottage garden. Dwarf Irises (Iris reticulata), which only get about 6 inches tall, are the earliest to bloom in spring and really start a cottage garden off well. Siberian Irises (Iris siberica) bloom in mid-spring, in blues and white. They reach about 2 ft. tall and provide beautiful filler while other perennials are still growing just leaves. I wish they bloomed longer. The Dutch, or Beauty, iris have orchid-like flowers that bloom throughout spring and early summer. They can be a bit temperamental and short-lived, but they make great cut flowers. The real trick to getting lots of blooms from your irises is to plant several varieties with different bloom date. There are certainly enough to choose from, some are even fragrant. When Lady’s Mantle (Alchemilla mollis) is in bloom, it steals all the attention. The soft, fuzzy leaves are cup-shaped. When a drop of water falls on the leaves, it beads up and rolls around, which can be mesmerizing when there are drops on several leaves. But it’s the flowers that really catch the eye. Sprays of small, chartreuse flowers shoot up above the foliage, until they are so full and heavy they flop over and turn this clumping plant into a softening ground cover. You will often see Lady’s Mantle used along paths and spilling out into them. The flowers dry well and look good as they age and the foliage stays attractive all season. The chartreuse color and the distinctive leaves are great foils for pastel cottage plants, making the pale colors more vivid and alive. I haven’t found many named cultivars, other than ' Thriller', which has larger leaves than the species, but lacks its floppy charm. You can’t have a cottage garden without roses. Billowy cabbage roses, climbers and ramblers, shrubby roses and rugosas - there is no more romantic flower for creating cottage charm. An often overlooked element of cottage gardens is fragrance and the older roses certainly provide it. Roses can add structure to an informal garden, while still adding to the general softness. 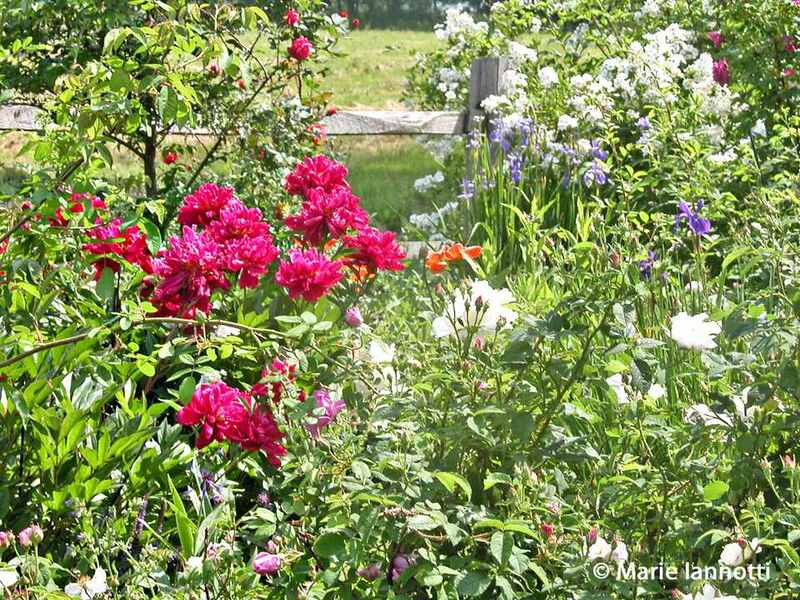 Do yourself a favor and stay away from fussy hybrid teas, for the cottage garden. Since roses can be prone to problems, look for plants well suited to your growing conditions and with some disease resistance. But don’t avoid roses just because you’ve heard they need a lot of care and pruning. A cottage garden is the perfect place to experiment with them, because a little untidiness just add to their charm. And roses can be very forgiving. I won’t recommend any specific plants. There are just too many to choose from and they are always adding more. My only other word of advise is to make sure at least one plant is scented. Too many modern roses have sacrificed scent for better performance. While I love the ease of modern roses, you can forgive a rose its few flaws for one whiff of that glorious scent.